The term adaptation enjoys a variety of applications, of which the scientific and cinematic use most immediately come to mind. While the term clearly resonates in these spheres, adaptation certainly can be found beyond them: psychology, education, politics, and economics likewise experience what could be termed adaptation in response to both external and internal forces. 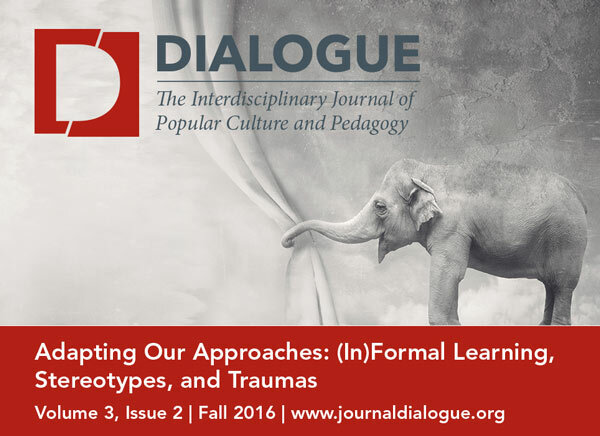 In this issue of Dialogue: The Interdisciplinary Journal of Popular Culture and Pedagogy, Adapting Our Approaches: (In)Formal Learning, Stereotype, and Traumas, authors from several fields, ranging from the visual and performing arts to rhetoric to social justice, explore the role of adaptation in a number of contexts. To introduce the concept of adaptation, Laurence Raw offers a guest editorial in which he considers the idea relative to a recent visit to the city of Albuquerque and the 2016 Southwest Popular/American Culture Association conference. Raw encourages the reader to move beyond a binary approach to adaptation, inviting an examination of the relationships between events, cultures, and people and how individuals might respond to adaptation. Our first area of examination is that of education and literacy, as the initial articles address adapting learning in a variety of contexts. Janis Harmon and Roxanne Henkin examine the power of books in changing students’ perception of social justice, reminding us that learning takes place both within and outside formal classrooms. In keeping with this idea of lifelong learning, Magnus Persson discusses the paradox of high culture as entertainment, describing a live book club in which musicians adapt literary texts through performance. The final article within this section, by Sheldon Kohn, seeks to expand our thinking about learning and teaching in general, proposing a shift from grand narratives to everyday change. The second group of articles delves into the tensions between stereotypes and reality, addressing first Native American rhetoric and then masculinity in the shifting narratives of professional wrestling. Edward Karshner considers Diné rhetoric and its ability to affect an individual’s perception of reality by means of participation in Navajo ceremonies. Marc Ouellette continues by examining televised professional wrestling in the 1990s, focusing on the roles of masculinity and corporatism in the genre into the twenty-first century. The final section of the issue addresses trauma in two popular television programs. Adam Crowley discusses the impact of psychological trauma in the AMC series The Walking Dead, both to the characters on the show and, beyond the medium, to social movements. Further considering trauma, Courtney Weber presents the case for considering trauma as seen from the varied perspectives of detective and serial killer, with potential real-world application in responding to survivors of trauma. We conclude this issue of Dialogue with a review by Lexey Bartlett of Laurie Kahn’s film Love Between the Covers (2015), a documentary which explores the creation and consumption of romance novels in historical and contemporary contexts. Together, the essays in this issue encourage viewers, educators, and readers to reconsider the interplay of various texts, the means by which we approach them, and the continued expansion and exploration of the field of popular culture studies.